The chorion is the portion of fetal membrane that eventually forms the fetal side of the placenta. The chorion contains chorionic villi, which are small finger-like projections. These villi are snipped or suctioned off for study in the procedure. 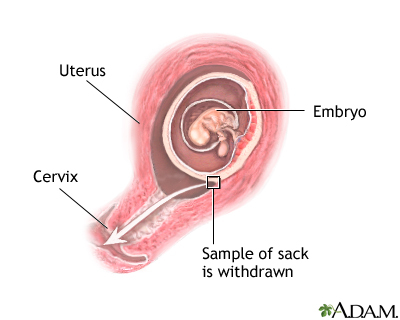 Since the chorionic villi are of fetal origin, examining samples of them can provide the genetic makeup of the fetus. This test is performed to identify congenital defects. Experts use the sample to study the DNA, chromosomes, and enzymes of the fetus. The test can be done before amniocentesis, about 10 to 12 weeks after a missed period.